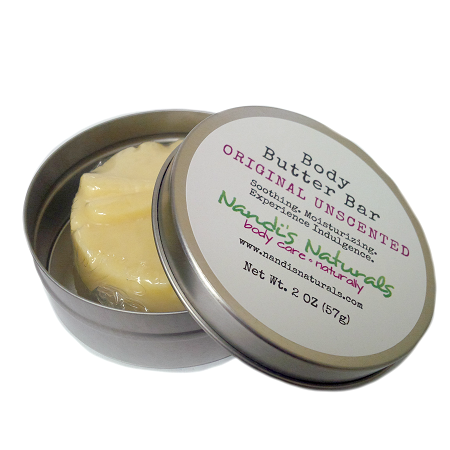 Nandi’s Naturals Original (Unscented) Body Butter Bar makes dry hands, heels and other moisture-deprived body parts a thing of the past. Organic coconut oil creates a moisture base, while cocoa butter and beeswax lock in the moisture. Our Original Body Butter Bar is ideal for those who want soothing relief, yet can do without the added fragrance. Nandi’s Naturals body bars come in handy, decorative tins that can be slipped into your purse or placed right next to the bathroom or kitchen sink. Perfect for expectant mothers, our body bars make for an unforgettable belly rub or foot massage. 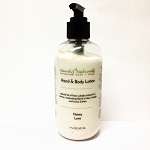 Our unscented body bar is excellent for use on baby as well. Grasp bar into palm of hand. Using smooth side of bar, lightly glide over skin, paying special attention to problematic areas such as elbows, knees, heels and hands. After applying the butter to wherever needed, massage the lusciousness deep into the skin until absorbed. A pair of cotton socks placed on the feet after application will have your feet doing the happy dance in the morning. Caution: THIS IS NOT SOAP! Keep bar out of direct sunlight and extreme heat to prevent melting.